Last week my wife was up at a conference in Lincoln, Nebraska. Having the afternoon off I decided to see if I could find any old aircraft worth visiting in the area, given that we knew we’d be visiting the Strategic Air and Space Museum the following day. 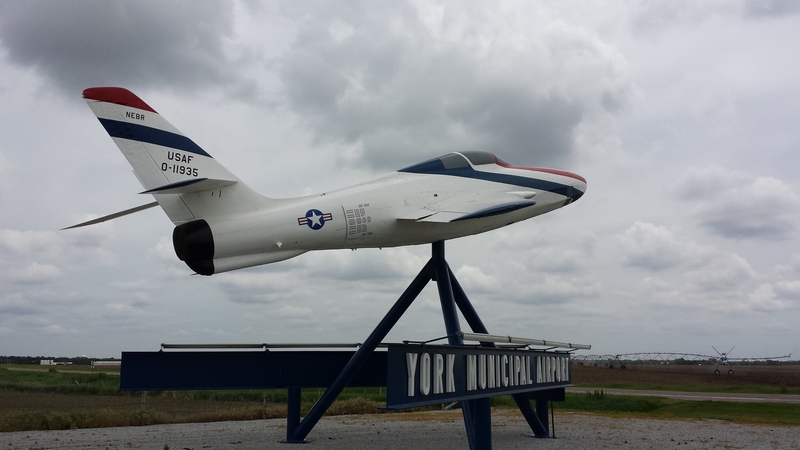 What followed was a slightly delightful odyssey across South-East Nebraska taking in four small municipal airports which had old military aircraft in varying states of preservation on their land. First up was York Municipal Airport, which had this rather nice RF-84F on display – this is Republic RF-84F-10-RE Thunderflash 51-1935 which according to Joe Baugher probably didn’t serve in the USAF or Nebraska ANG but was supplied to a NATO country (others in the production line went to Turkey, West Germany and the Netherlands) before being returned to MASDC for disposal. 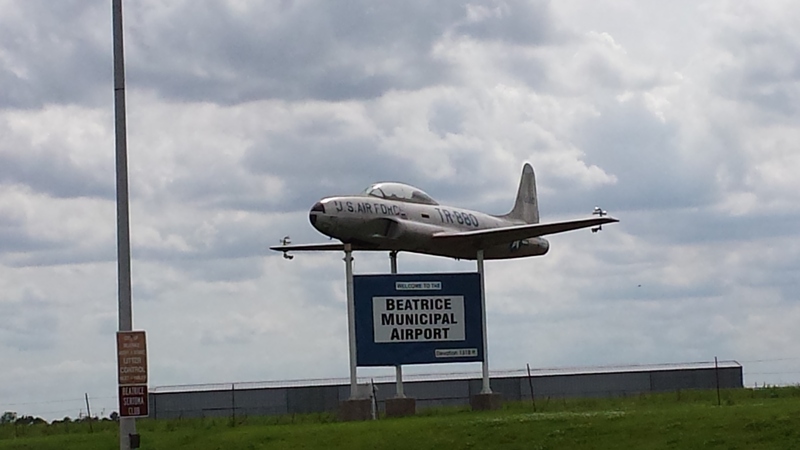 After a long drive and a brief excursion up a dirt road I came to the Municipal Airport at Fairbury, where I saw this rather sad looking T-33 – Lockheed T-33A-1-LO 51-9111. It was, as you can see, in a pretty sorry state. The cockpit canopy has gone, and a section of the vertical stabilizer. 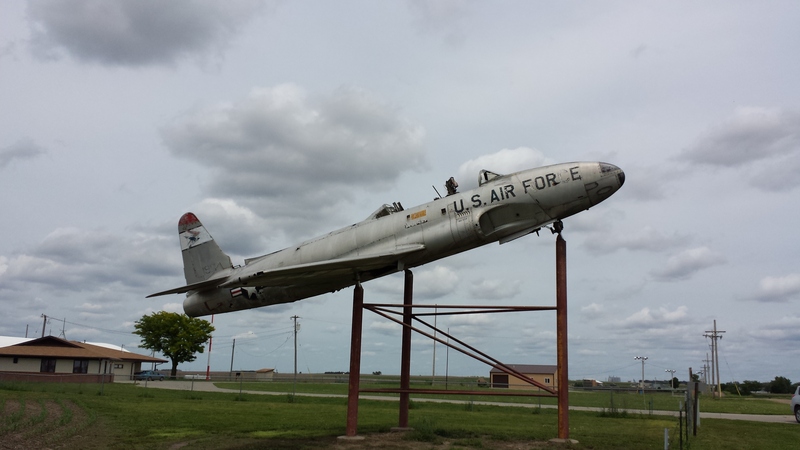 My 10-year old guide book implied there was an F-100 somewhere in Fairbury but I didn’t see it at the airport. 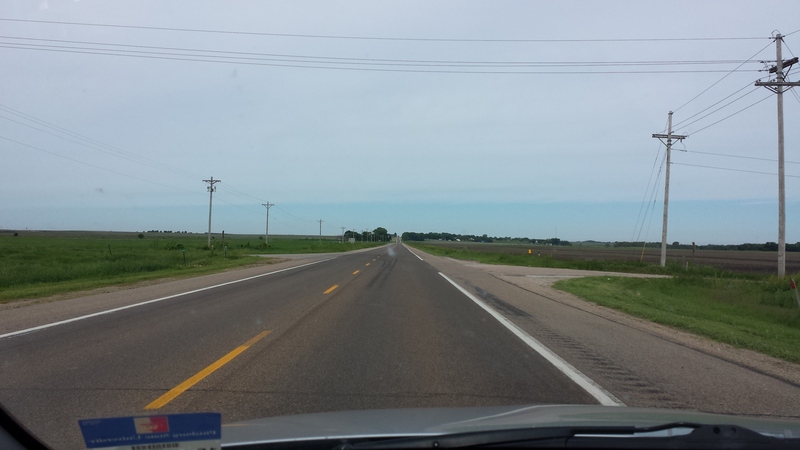 A little way further on I came to Beatrice (not pronounced the way I say it!) and saw another T-33 in a slightly less sorry state. Lockheed T-33A-1-LO 51-8880, which seems to have had some lights added to the wingtips for signage illumination purposes. As things were starting to get late, it was time to head to my last stop at Crete, where I found an interesting F-86D at the Municipal Airport. North American F-86D-40-NA Sabre 52-3735. I couldn’t help noticing the badge of the Seabees on the concrete plinth. This was the formal ending of the afternoon’s activity but I had a couple more examples to show over the following days before we came back to Kansas. 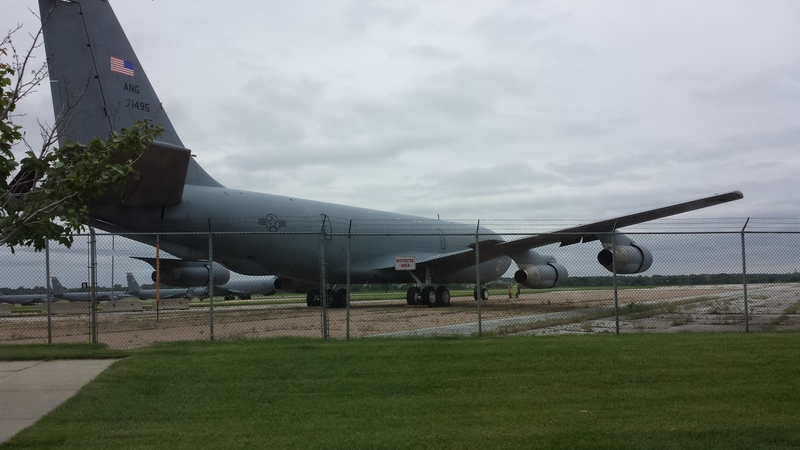 I didn’t want to contend with the Lincoln traffic on a Friday afternoon, but after we saw a KC-135 land at the ANG base adjacent to the airport we had a poke around on Saturday morning and found 57-1495 parked on the fence line. Joe Baugher says it’s a KC-135E which started life as a Boeing KC-135A-BN Stratotanker. I’m not absolutely sure if this is an active aircraft since the other KC-135s in the background look like KC-135R models with the re-engine mod done. No doubt someone can set me straight. 🙂 There is supposed to be an F-86L, a T-33, an F-4 and something erlse at the ANG base but I only caught a faint glimpse and couldn’t work out where to go to get closer. Up at Ashland, and at the Strategic Air and Space Museum. A few Aircraft are now being displayed outside. 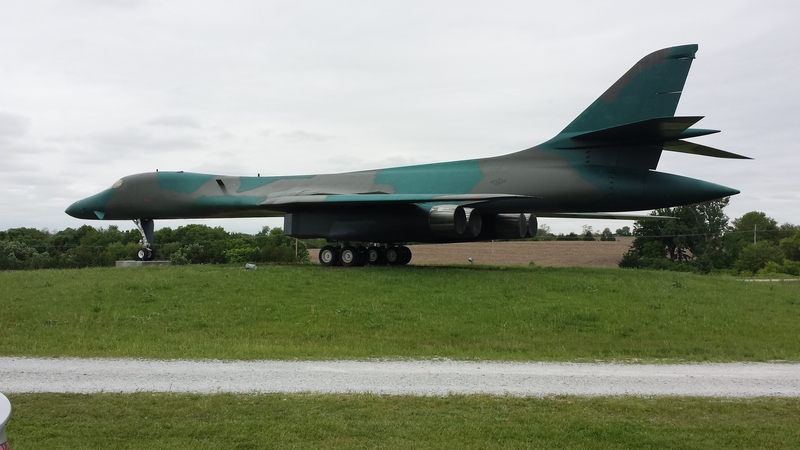 Chief among them is Rockwell International B-1A Lancer 76-0174, which was previously on display at Wright-Patt and moved to Nebraska at the end of 2003. I don’t think the paint scheme is exactly accurate for this specific aircraft, or how much it’s faded, but it looks impressive for now. Inside the atrium, I understand actually the Atrium was built around it, is a certain Blackbird. 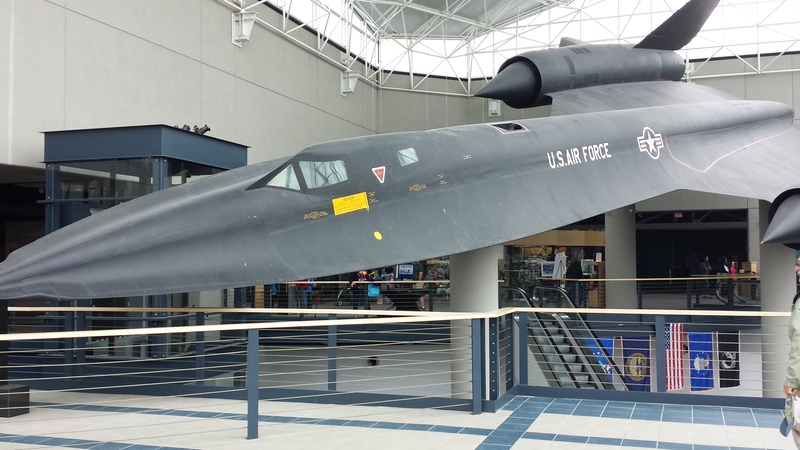 Lockheed SR-71A, AF Serial 61-7964 (c/n 2015). And hidden around the back, while the airframes are being reshuffled, is one of my personal favourites, Avro 698 Vulcan B.2 XM573. It looks a little folorn, but not as folorn as the wingless EC-135 sitting next to it (just off the left edge of my picture here). ‘573 sat at Offutt AFB gathering moisture and rust from 1982 until 1998 or thereabouts, (look at the jet pipes if you want your own proof) and looks likely to gather a little more before they bring it inside again. 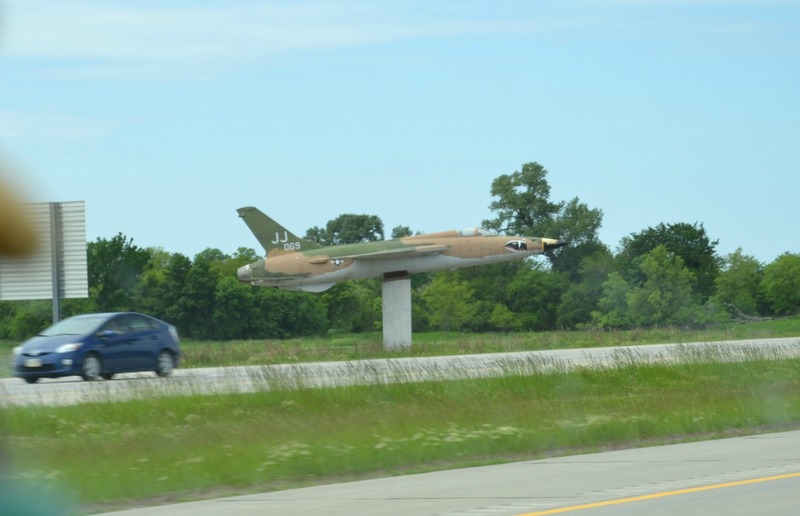 And finally, up a pole on I-80 advertising the Strategic Air and Space Museum we find Republic F-105D-15-RE Thunderchief 61-0069. As I’ve said in a few places before this machine is a documented Vietnam war combat veteran, having shot down a North Vietnamese MiG-17 with an AIM-7 missile on June 3, 1967. 0069 was held by a museum in San Bernadino, CA until the Strategic Air and Space Museum bought it and hoisted it up its pylon on the Interstate. It seems rather an unsuitable end for such a veteran. All in all it was a very enjoyable weekend even if I do differ with the Strategic Air and Space Museum on a few of their approaches to preservation and conservation. However they are the ones on the ground doing the work in difficult circumstances, so I’ll save my armchair quarterbacking for some other place. 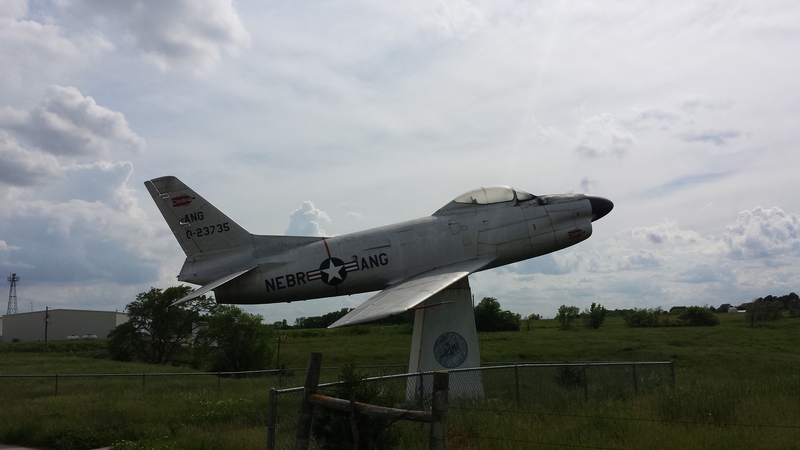 The T-33, F-86L, and RF-4C at the Nebraska Air National Guard base in Lincoln are in the secured area of the base in an “Aircraft Garden”. I saw it a couple times while on base for a special activity. I have a pic of each aircraft if you would like to see them. Here is a link to the photobucket gallery where I have pictures from my refueling flight. There is a photo of each of the aircraft in question in the gallery as well. i forgot, there is also an RF-84F Thunderflash in the “Aircraft Garden” at the Lincoln ANG base. Regarding the KC-135E parked near the fence. It arrived at Lincoln on 9/27/2009. Built as a KC-135A-BN in 1957 as c/n 16566/T0175. It served with the Kansas ANG 117th ARS/190th ARW “Coyotes” from Forbes Field, Topeka, as well as the Arizona ANG 197th ARS/161st ARW “Copperheads” from Phoenix. 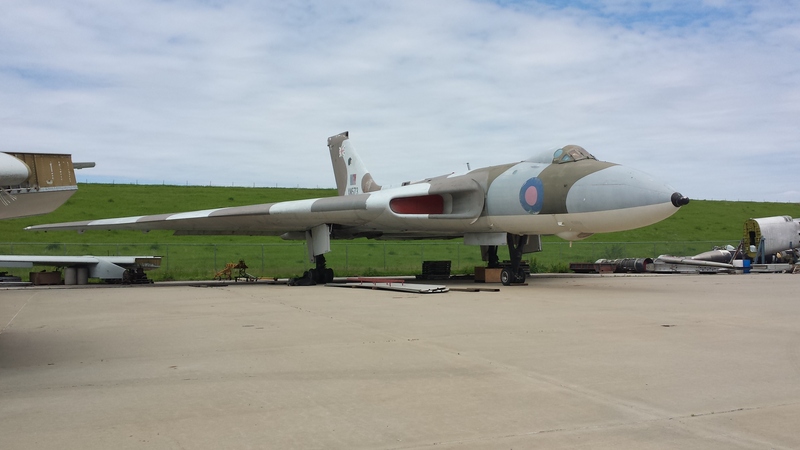 I don’t know if it ever flew for the Nebraska ANG, but the intention is to eventually place it on display at Lincoln. Perhaps as a gate guard? You are correct the E model KC-135 was procured for the purpose of displaying it. This aircraft was never assigned to the 155th ARW, it had a one time flight into Lincoln and was parked. We stripped it of componets deemed re-usable, drained of fluids and there it sits.